When Mats P. Malmer started new excavations at the Alvastra Pile Dwelling between the year 1976 and 1980 the excavation area was divided up into four trenches – the Eastern, the Western, the Middle and the Investigation trenches. Investigations in these trenches were directed by four different archaeologists – Mats P. Malmer (Eastern), Hans Browall (Western), Arne Hallström (Middle) and Gunborg O. Janzon (Investigation). The excavations were financed by the Humanites Research Council from 1976 – 1984 and from 1986-87. The project budget did not include much money for post-excavation work. When Mats Malmer retired from the Department of Archaeology at Stockholm University in 1987 work on the publication of the excavations became the responsibility of individual scholars (Browall 2016, p. 15 ff). 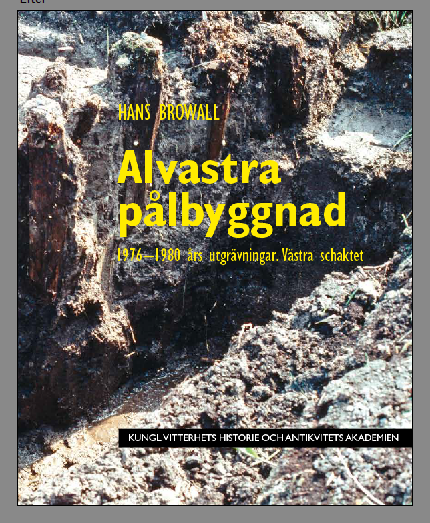 In his new book, published recently by the the Royal Swedish Academy of Letters, History and Antiquities, Hans Browall describes and analyses the excavations of the Western Trench he was responsible for. Below follows an English translation of an abridged version of the advertisement for the book distributed by the publisher. The book is in Swedish with summaries in English and German. The aim of the excavations was to supplement earlier excavations with detailed stratigraphic information. Previously unpublished radiocarbon dates of human bones are presented. Together with previously reported dates of plant material, these dates show that the the pile dwelling site was probably used for much longer than previously thought – in principle almost all of MN A. The Western Trench belongs to the western section of the inner pile dwelling. Finds in this section differ from finds in the eastern inner section. Here more burnt flint was found, more Funnel-Beaker pottery and more human bone, to a large extent burnt. Among the human remains at least three distinct patterns show that secondary burial was practiced during the whole period of use of the pile dwelling. Funeral ceremonies seem to have been more frequent at the end of MN A, something which is discussed in the light of new radiocarbon diagrams. On the accompanying CD disc all the features of the field plans have been digitized and collected in a dwg file showing the various features in all layers of the excavated trench. Hans Browall is Associate Professor in archaeology. He has been conducting archaeological research in western Östergötland for the last forty years. Browall, H., 2016. Alvastra pålbyggnad. 1976 – 1980 års utgrävningar. Västra schakt. Kungliga Vitterhets, Historie och Antikvitets Akademien handlingar, antikvariska serien 52. Stockholm.